At this year’s Bangkok International Motor Show, Rolls-Royce retook its place at the pinnacle of super luxury with patrons in Thailand. The brand chose to showcase its Phantom Extended Wheelbase flagship, paying homage to a country highly preferential to the grandest variants of super-luxury limousines. Since 1925, Phantom, especially in its Extended Wheelbase format, has conveyed some of the world’s most influential and powerful men and women to the most defining historical moments. Today, this iconic luxury masterpiece is reborn, setting a new standard for super luxury. New Model Phantom is the only super-luxury car in the world which features its own moving art gallery on the fascia, allowing customers the freedom and creativity to specify highly bespoke art commissions. Rolls-Royce Motor Cars showcased a truly exquisite work of art today at the 39th Bangkok International Motor Show 2018. A Phantom Gallery inspiration was unveiled alongside the grand public premiere of New Phantom, based on one of the most significant icons in Thai culture, the Ratchaphruek flower. According to officials from The National Identity Office in Thailand, the Ratchaphruek or Khun is a widely-known local flower, grown across all regions of the country. It is considered one of the most auspicious and mysterious trees, able to live for a long period of time whilst maintaining a beautiful shape and flower bloom. On 2 October 2001, the Government announced that the Ratchaphruek would become the national flower of Thailand. Inspired by the significance of the Ratchaphruek flower, this Gallery inspiration artpiece was commissioned by Rolls-Royce Motor Cars Bangkok, working in close partnership with world-renown porcelain craftsmen Porzellan Manufaktur Nymphenburg. “Rolls-Royce customers in Thailand appreciate art and are proud of their rich cultural legacy. Our dealership celebrated this with the bespoke KoChaMongKol Ghost in 2016, and again with this distinct Gallery inspired by an important Thai cultural icon. New Phantom is our most bespoke motor car– a pinnacle product that is truly one of one,” Mr. Sunthornpan Dhechatech, General Manager for Rolls-Royce Motor Cars Bangkok said. In its eighth generation, New Phantom offers a thoroughly contemporary design interpretation of Rolls-Royce DNA – one that symbolizes sheer power of presence. “Cutting-edge innovations include a new exclusive ‘Architecture of Luxury’, an all-aluminium spaceframe designed to underpin every future Rolls-Royce; and a peerless ‘magic carpet ride. We are confident that New Phantom will once again take its place at the pinnaclde of luxury in Thailand, country of historic and future strategic importance to us,” Mr. Ian Grant, Asia Pacific Regional Sales Manager for Rolls-Royce Motor Cars said. The ‘Magic Carpet Ride’ experience is enhanced to levels of near-silence on New Phantom, thanks to the integration of a slew of new technologies, 130kg of sound insulation and an all-new, effortless 6.75-litre twin turbocharged V12 engine delivering 563hp and 900Nm of torque. Accompanying the increased stiffness of the spaceframe is a best-in-class high comfort chassis with air suspension and state-of-the-art chassis control systems and new innovations like four-wheel steering, delivering ‘effortless’ ride and handling amid the bustling streets of Bangkok. When Rolls-Royce’s acoustic test engineers reviewed the results of road and vibration tests, the sound levels were so low they had to check their instruments were calibrated correctly. In addition, New Phantom is equipped with the ‘Flagbearer’ – a new stereo camera system integrated in the windscreen to see the road ahead and adjusts suspension proactively, more than 100 times a second. At night, laser headlights provide a 600 metre range of vision, and combined with Night Vision ensure safe travel in and around Thailand. A selection of rear seating options is available on New Phantom, from lounge to individual formats. Technology is always hidden until required, leaving only the visual majesty of curated wood, leather and billeted metal for all to admire. The Architecture of Luxury, the Magic Carpet Ride, The Suite and The Gallery: the best possible materials in the world, peerless design and engineering combine to create the New Rolls-Royce Phantom, resetting the benchmark not only in the automotive arena, but as the world’s leading luxury item. As the next chapter in Rolls-Royce’s story begins, the New Rolls-Royce Phantom points the way forward. 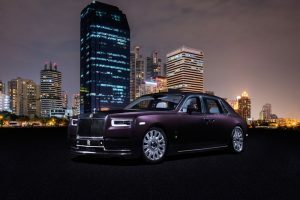 The New Rolls-Royce Phantom revealed for the first time to Thai audiences is an Extended Wheelbase variant finished in Belladonna Purple with a Purple Silk/Arctic White two-tone interior. Customers can currently place orders for a New Phantom with a delivery lead time of approximately 6 – 9 months. Retail pricing is from 53.5 million THB for a Standard Wheelbase and 59.5 million THB for an Extended Wheelbase. – Dawn, finished in an Anthracite/Silver two-tone exterior and a Seashell/Black two-tone interior.